Native VHD boot is currently supported only on certain versions of Windows and is disabled on other versions of Windows. This article/tutorial shows how all versions of Windows 7 can be installed and booted from a fixed size VHD using a free driver called Firadisk built by Karyonix @Reboot.pro. 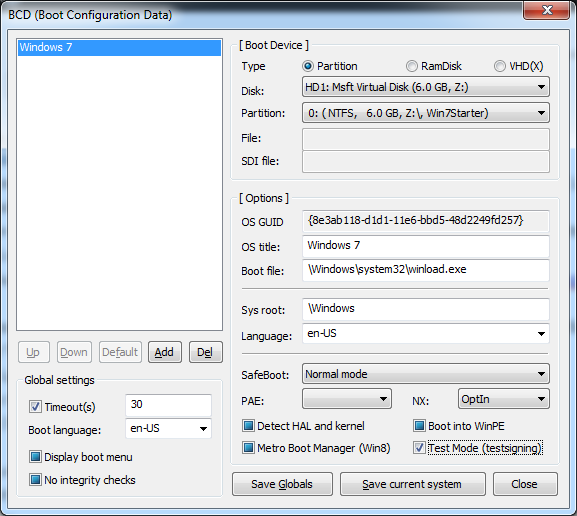 This article is a continuation of my previous article – Native VHD Boot on unsupported versions of Windows 7, and I suggest you read that before continuing with this article. Please note that this tutorial is meant for advanced users. If you don’t know how to mount an ISO/VHD or are not comfortable installing and using custom bootloaders, then this article is not for you. It supports only Fixed Size Contiguous VHD. No support for dynamic VHDs. The below steps were tested on Windows 7 Ultimate 64 bit. Most of the steps are similar to my previous article. 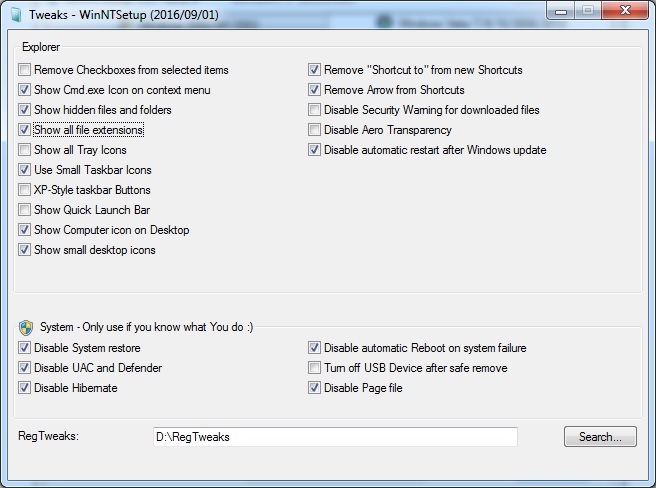 Download and extract WinNTSetup. Run WinNTSetup_x64 or WinNTSetup_x86 as Administrator depending on your operating system. Click on Tweaks in WinNTSetup and select the folder containing the registry file that you created above. Make sure the folder does not have any other files. In the below screenshot, I have chosen D:\RegTweaks as the location of the FiradiskEnum.reg. You can additionally choose any other tweaks that you want from this page. Once it is done, close this window. After the installation completes, download and extract the latest version of Firadisk (currently 0.0.1.30 ). Open the Windows Command Prompt as Administrator and navigate to the folder where you have extracted Firadisk. Run the below command to integrate Firadisk Driver using Dism. Replace Z: with the drive letter of your mounted VHD. Edit the Grub4Dos menu.lst and add the below entry to boot from the VHD. Replace Windows7.vhd with the actual filename of your VHD. If you get the error “File for drive emulation must be in one contiguous disk area”, then you need to defragment the VHD file using a tool like WinContig so that it is contiguous. Thank you for this excellent tutorial, very easy to follow. I have been reading some of your interesting articles – thank you. 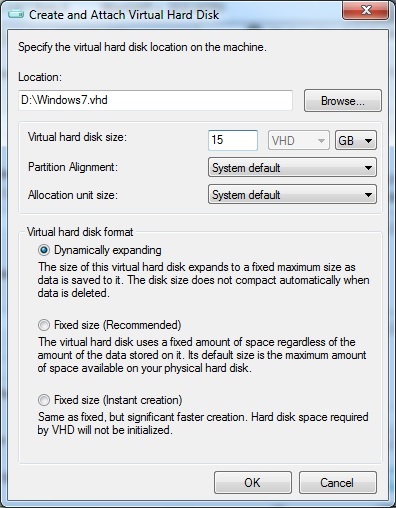 Your description of Firadisk is: “It supports only Fixed Size Contiguous VHD. No support for dynamic VHDs”. But the first image has the “Dynamically expanding” option selected so it’s a little confusing – I assume the image is not correct? I’m going to try this Firadisk version and your other VHD how-to (native boot) just for fun! I don’t have Win7 installed on my laptop since moving to Linux a couple of years ago so I used Win7 in VirtualBox to create a WinPE and then Rufus to put it on a stick – I’ll be doing everything from that. I’d love to read your thoughts on how to boot a VHD from USB using either of your methods… hint hint for another excellent tutorial! 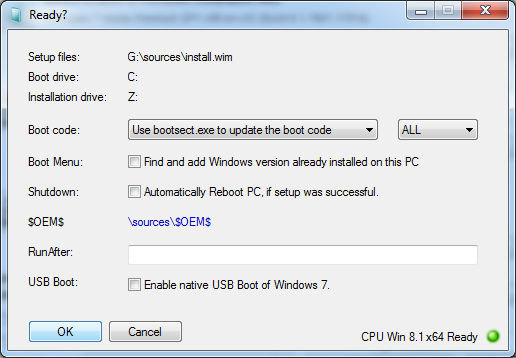 Easy2Boot can directly boot from Windows VHDs (7/8/10) – just copy the file over to the USB drive. If you make one using this firadisk method (for Home or Pro) then just copy it to your Easy2boot USB drive and give the file a .vhdfira file extension.